Orange County is a wonderful travel destination and a beautiful place to call home. Tourists and locals love the beaches, wilderness parks, and historic sites. Each day, commuters and trucks make the trip to L.A. and back again. A recent traffic study reported up to 377,000 commuters traveling I-405 each day. It’s no wonder, then, that our roadways are so congested; accordingly, truck accidents occur frequently despite local efforts to upgrade roadways, decrease traffic, and promote safety. When a tractor-trailer rig crashes into a private passenger vehicle, the results are unfortunately predictable. Tractor trailers cause extensive damage and devastating injuries. Truck accident victims can undergo years of medical treatment and rehabilitation. Even still, they’re often left with chronic pain, disfiguring scars, or disabilities that diminish their quality of life. Size is a primary factor in truck accident outcomes. The most recent National Highway Safety Traffic Administration data shows large truck involvement in 4,213 fatal accidents nationwide, and 322 fatal crashes in California. Eighty percent of those trucks weighed over 26,000 pounds; a truck’s size becomes dangerous when combined with speed and driver error. At Aitken * Aitken * Cohn, we’ve developed our truck accident knowledge through over 40 years of first-hand experience. Our legal team has a strong working knowledge of California and Federal truck laws, and we are widely respected consultants on liability statutes, accident causation, and catastrophic injury litigation. We have statewide resources to investigate, analyze, and prepare our clients’ cases. This gives us an edge in managing the complexities inherent to truck accident cases. Our legal experience and dedication have brought us numerous professional awards, “Best Law Firm” rankings, and overwhelmingly positive peer reviews. $5,750,000 settlement: A truck driver towing a large piece of equipment made a left turn in our client’s path. Our client sustained serious physical and emotional injuries. We avoided a trial by settling after presenting a clear liability case. $55,000,000 judgment: A government employee driving a Department of the Army vehicle ran a red light, striking a Chevrolet Suburban. The impact seriously injured the mother, who was driving the Suburban, and paralyzed her 9-year-old daughter. Our firm won an unprecedented $55 million dollar judgment against the US Government after a five-year legal struggle. $19,422,000 settlement: A commercial driver for the Roe Corporation ran head-on into an oncoming vehicle, killing a local physician. Our firm settled a wrongful death case on behalf of the decedent’s estate. $4,127,000 settlement: A driver under the influence of amphetamines caused an accident when the brakes failed on his overloaded dump truck. The crash killed an Anaheim Hills Optometrist; our firm settled the wrongful death claim. $3,100,000 settlement: A truck struck a retired 72-year old grandfather while he was crossing the street. $3,000,000 settlement: A dump truck lost momentum while exiting a job site excavation pit. The truck rolled backward, killing a young geologist working at the site. Who Can Be at Fault for a Truck Accident? Truck accident cases are complicated, and often difficult to resolve because of the long list of potentially liable parties. When you see a truck traveling Orange County roadways, the driver is one of many entities responsible for placing that vehicle on the road. When Aitken * Aitken * Cohn investigates a truck accident, we evaluate the potential for liability on behalf of both obvious and not-so-obvious individuals and companies. Many entities’ relationship to the truck may make them just as responsible as the negligent driver. Truck driver: A truck driver’s responsibility for an accident is based on failures, errors, or actions the driver should have taken but didn’t. A driver may cause a crash by speeding, distracted driving, operating under the influence of drugs or alcohol, or other negligent actions. Drivers fall asleep at the wheel despite industry driving time restrictions and tracking via paper logs or Electronic Logging Devices (ELDs). Driver’s employer: If a driver is operating a truck as an employee, the employer is often responsible for the driver’s negligent actions on the road. Motor carriers are also bound by a duty to monitor and track a driver’s time on the road and their duty status. Most trucks in the United States are now compelled by congressional mandate to install ELDs to perform tracking and monitoring tasks. Truck owner: Often, a truck is owned by one company and leased to another company or an independent operator. The owner may be liable if a vehicle they leased was defective or had other maintenance or safety issues that contributed to a truck accident. Trailer owner: A tractor owner often connects to a trailer owned or leased by another entity. The trailer owner may be responsible for trailer defects or safety problems if they contributed to an accident. Product shipper: Improper loading is a common cause of truck accidents and rollovers. If a driver hooks a rig up to a pre-loaded trailer, the shipper bears some responsibility for a load-related crash. Drivers and motor carriers must follow the North American Cargo Securement Standard. If a separate entity is responsible for loading the trailer and failed to comply, they may be negligent as well. Maintenance contractor: When a contractor maintains and repairs a commercial truck fleet, they may be liable for repair and maintenance-related accidents. This may include faulty braking systems, failed steering mechanisms, or other improperly maintained vehicle systems that contributed to an accident. Truck manufacturers: Some trucks leave the manufacturer with latent defects. When such defects aren’t easily detectable, they may cause an accident while the truck is in service. 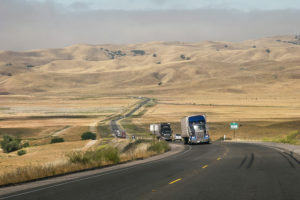 Truck drivers traveling California roadways have a duty to follow the laws designed to protect their fellow motorists. Before they qualify for a commercial driver’s license, a trucker must know and understand the state and federal laws that govern their actions. The laws are complex and subject to revision, but that’s not a valid excuse when a truck driver fails to follow the law. Our attorneys have a comprehensive knowledge of state and national trucking laws. We understand how they may affect your truck accident injury claim, and how to proceed accordingly. Our knowledge allows us to provide the most effective representation. We understand that when a trucker disregards these and other statutes, it’s often a red flag that points to liability. Right lane rule: In California, commercial trucks must travel in the far right traffic lane. They may drive in the adjacent lane when traveling on a divided four-lane highway. Failure to maintain a legal lane position is a common cause of truck accidents. Speeding: Excessive speed and speeds unsafe for road conditions are common truck accident causes. California law designates that certain vehicles adhere to a 55-mile per hour speed: trucks with three axles, vehicles towing another vehicle or transporting explosives, school buses, farm labor vehicles with passengers, or trailer buses are all included. State laws also prohibit truckers from creating safety hazards by driving too fast or too slow. Former traffic offenses: NHSTA Large Truck statistics show that fatal truck accidents often involve drivers with a prior accident history. California laws recognize the potential for problems when truck drivers have prior convictions. Citations for excess speed, reckless driving, and other offenses may disqualify a driver from operating a commercial vehicle in the state. What Damages Can a Victim Recover When a Truck Accident Injury Occurs? An injured person may make a claim for damages under two broad categories: economic damages and general damages. Costs to replace household services an injured person can no longer perform: lawn mowing, dish washing, child care, etc. When an insurer pays injury-related medical expenses, the policy may include a subrogation provision. This gives the insurer a legal right to make a claim against a responsible party for medical expenses paid to or on behalf of an insured. An injured insured has a responsibility to protect the insurer’s subrogation rights. What Ways Do Liable Parties Try to Get out of Paying for Their Negligence? When a truck accident causes catastrophic injuries, our clients expect the driver or the insurance company to acknowledge fault and pay the damages they owe under the law. Unfortunately, it often doesn’t work out that way. As our legal team interacts with the drivers, owners, lessors, shippers, and others in the chain of responsibility, we encounter numerous parties trying to avoid legal liability through various means. No negligence: A defendant driver, owner, shipper, or any other involved party may defend themselves by asserting they committed no negligent acts. Comparative negligence: The driver and others may claim that the injured person was partially at fault for the accident. No defect: Even when a defect is apparent, a brake failure, for example, the formal defense position may assert there was no defect or malfunction. Contractual transfer of liability: When the entities involved have contracts with hold harmless and/or indemnification agreements, they may rely on another defendant to assume their liability and pay damages on their behalf. Damage dispute: Some defendants may acknowledge liability, but dispute the injury’s severity. They use this style of defense hoping to minimize the damages. Our associates believe that justice is a universal right. If you were hurt in a truck accident in Orange County, we invite you to take advantage of our free consultation. After our initial assessment, we determine if we can help you, and if we have the available staff and resources to give your case the personal attention it deserves. Our firm handles our client’s cases on a contingency basis: We charge a fee only if we successfully settle a case or achieve a verdict. If you’re injured in a truck accident in Orange County, contact Aitken Aitken Cohn immediately to learn how to protect your rights. Call us at (714) 434-1424 to arrange a free consultation, or complete our online contact form.